Researcher Sanjoy Ghosh, in his lab at UBC’s Okanagan campus. UBC researcher Sanjoy Ghosh wants to better understand how diet can cause chronic cardiovascular complications for people trying to control diabetes and obesity. 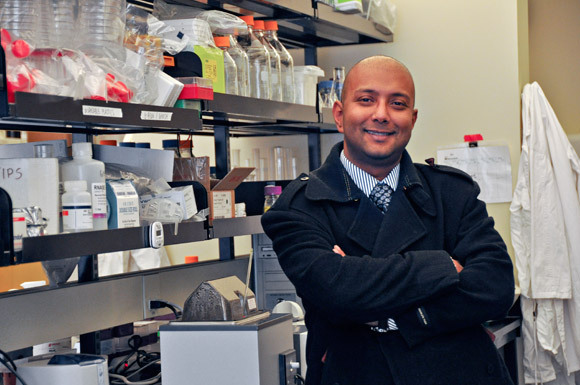 Ghosh, assistant professor of biology with the Irving K. Barber School of Arts and Sciences at UBC's Okanagan campus, is investigating the role Omega-6 polyunsaturated fatty acids (PUFA) play in the development of heart disease in people with diabetes and obesity. Omega-6 PUFA includes vegetable oil, canola oil, corn oil, sunflower oil and safflower oil, all commonly used in food products in Canada, and a major staple of the North American diet. Omega-6 is generally thought to be a “healthy” fat, but Ghosh notes that his own research, as well as other recent studies, suggests too much Omega-6 could cause inflammation and damage the heart muscle. Some medical research suggests that excessive levels of some Omega-6, relative to Omega-3 PUFA, may increase the probability of a number of diseases, such as colitis, insulin resistance, diabetes and even obesity. Fifty years ago, before Omega-6 was widely promoted as a health benefit, the ratio of Omega-6 to Omega-3 PUFA found in the human diet was close to a one-to-one ratio, says Ghosh. "Nowadays, the ratio is closer to 20:1," he says of the bandwagon effect with North Americans consuming more vegetable oils and less and less fish. As a result, people have turned to fish oil pills containing Omega 3 PUFA to help 'match' their intake of Omega 6. "The breakthrough we saw in our lab was the inflammation caused by the Omega 6 fatty acids gets worse with the addition of Omega 3," says Ghosh. To better understand the potential consequences of such fish oil supplements in the North American context, Ghosh and his research team, which includes research colleague Deanna Gibson, assistant professor of biology, fed mice a corn oil-based diet (rich in Omega-6 PUFA). This simulated the typical North American diet to evaluate metabolic stress, gastrointestinal health and heart function. Researchers then supplemented the diet with fish oil (Omega 3 PUFA) to determine if this would reduce the damaging effects of the vegetable oil diet. Unfortunately, this strategy initiated more damage and inflammation. "But why?" says Ghosh. "Our hypothesis is that levels of Omega 6 are so high in our bodies that any more unsaturated fatty acid -- even Omega 3, despite its health benefits -- will actually contribute to the negative effects Omega 6 PUFA have on the heart and gut. Bottom line is it's too much unsaturated fat, and our body doesn't know what to do with it." Ghosh believes this research helps contribute to the case against a magic pill” solutions to nutrition and health. "Here's my opinion,” says Ghosh. “Lower intake of Omega 6 PUFA while increasing your consumption of fish and foods where Omega 3 occurs naturally, as seen with the Mediterranean diet. “Improper diet cannot be fixed by a pill. Polyunsaturated fats should be brought down in our diet, olive oil should be increased, and saturated fats should be increased -- they are the most natural, and have been part of our evolution since the beginning of time." For the next phase of research, Ghosh and Gibson are travelling to Kolkata, India, in March. They will conduct a study with a human population that aims to better understand the role and impact unsaturated fatty acids and saturated fatty acids have on the body. "In Kolkata, you have natural occurring populations that use palm oil or coconut oil (saturated fats) almost exclusively in their diet -- you just can't find those populations in North America," says Ghosh. "Then there are also pockets of people who mostly consume unsaturated fats in their diets, so within a fairly small geographical area we are able to gather the data we need without asking anyone to change their diet or consumption of food." Ghosh anticipates at least 500 people will take part in the study, which will involve collection of blood samples and interviews. "We want to see how the data collected from people compares to the data collected from the laboratory mice, and if the evidence is consistent in suggesting heart disease is made worse by eating a diet rich in the types of fats that are found in vegetable cooking oils." Ghosh's research has been funded by the Canadian Diabetes Association since 2007. "We were the first researchers in Canada who provided evidence that excess Omega 6 fats are bad in heart disease following diabetes. That was in 2004,” says Ghosh. “My research on dietary fats over the past decade has been very innovative and, consequently, very controversial. "I am so grateful to CDA because they believed in me, supported me and enabled me to pursue my research passions."